The wheat Reduced-height1 (Rht1) and rice (Oryza sativa L.) semi-dwarf1 (sd1) genes, which triggered the “green revolution”, widely enhance lodging resistance, harvest index and biomass production of crops [1-5]. The dwarfing mechanisms involved in plant phytohormone biosynthesis and signaling and other metabolisms have also been examined and discovered. Most dwarfing genes regulate the balance of endogenous phytohormone(s) to disturb cell proliferation and/or cell expansion, thus result in dwarfism [5-10]. Some dwarfing genes unbalance the biosynthesis or signaling of gibberellins (GAs) which play important roles in elongated growth, thereby cause dwarfism. For example, mutants Rht-B1 and Rht-D1 encode a GA signaling repressor reduce the response to GA, and then limit the elongation of wheat stems [3, 11]. d35 and sd-1 cause dwarfism in rice by disrupting GA biosynthesis [5, 12]. Several GA-related dwarfing genes and their dwarfing mechanisms have also been discovered in barley , Arabidopsis [14-15], sorghum , tobacco , and Brassica rapa . The disruptions of other phytohormones biosynthesis and signaling caused dwarfism have also been reported. 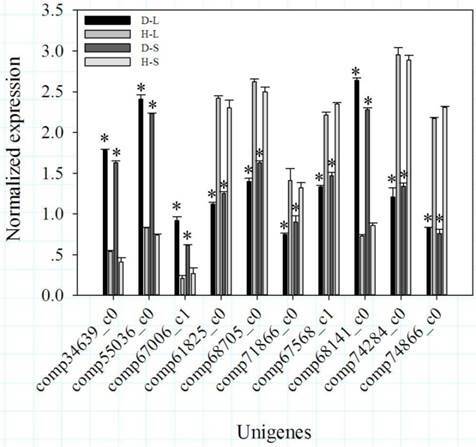 Mutant genes, such as d2, d11, d61 and brd1 in rice [6-7, 18-19] and dwf5, shrink1-D, dwarf4 and bes1 in Arabidopsis [8, 20-22], result in deficiencies of brassinolide (BR) biosynthesis and/or signaling and cause aberrant cell division or elongation, finally generate differentially BR-related dwarfisms. The mutant genes, smos and tdd1 in rice [23-24], abcb in Pearl millet , maize and sorghum , and bud1 in Arabidopsis , disturbed auxin biosynthesis, transport or signaling, cause dwarfisms. Meanwhile, other mutant genes caused deficiencies of strigolactones and salicylic acid also cause dwarfisms in rice and Arabidopsis [9, 28-30]. The general workflow and summary of the present study. 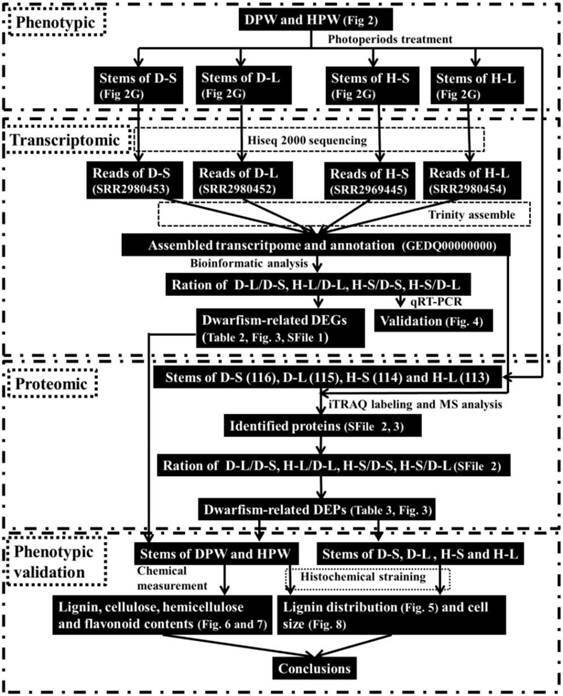 This study used morphologic, transcriptomic, and proteomic analysis, and phenotypic validation to construct unique transcripts and identify unique wheat proteins of DPW and HPW to discover the possible mechanism of dwarfism in DPW. In addition to these phytohormone-related dwarfing genes and mechanisms, the phenylpropanoid pathway, participated in many physiological processes [31-32], is also involved in dwarfism. Knockout of S-adenosyl-L-homocysteine hydrolase (SAHH) result in dwarfism with increasing cytokinin (CK) [33-35]. Silencing of cinnamyl alcohol dehydrogenase (CAD) causes dwarfism with reducing lignin content . Silencing of hydroxycinnamoyl CoA:shikimate hydroxycinnamoyl transferase (HCT) in Arabidopsis also results in dwarfism by accumulating endogenous flavonoid . To date, 10 dwarfing genes have been discovered in tetraploid wheat (2n = 4x = 28, AABB) [38-42]. Of these 10 genes, the recessive gene Rht-dp mapped on 4BS in Chinese dwarf Polish wheat (DPW)  reduces the coleoptile length and seedling leaf area . However, its dwarfing mechanism remains unknown. Additionally, Chinese Polish wheat exhibits low genetic similarity to T. durum, T. turgidum and common wheat [44-45]. Therefore, it is impossible to extrapolate the dwarfing mechanism of DPW from the transcriptomic and proteomic information of T. turgidum and common wheat [46-48]. With the advances of next-generation sequencing technology, RNA sequencing (RNA-Seq) has been widely used in plants lacking complete genomic information to find transcriptional evidence [46-49]. Meanwhile, proteomic analyses providing translational insights have also been widely used in wheat treated with salinity and drought , salt  and hydrogen peroxide stress . Additionally, the results of RNA-Seq can facilitate the identification of novel and known proteins and their roles in target traits [53-54]. The workflow of this study was shown in Fig. 1. We combined RNA-Seq and isobaric tags for relative and absolute quantification (iTRAQ) which widely used in wheat [52, 55] to construct unique transcripts and proteomes of DPW and a high Polish wheat (HPW), and then identified dwarfism-related genes and proteins to understand the dwarfing mechanism of Rht-dp. DPW, HPW and F2 (DPW×HPW) were grown in Chengdu, China, under a normal growing season. The plant height, leaf color, spike and glume length, seed size and 1000-seed weight were measured in maturation stage. At the beginning of stem elongation, every 20 DPW seedlings were sprayed (once a week) with a 1 mM abscisic acid (ABA) solution, 100 μM auxin, 50 μM CK or 10 μM BR, until flowering. Plant heights were measured at maturation. DPW and HPW seeds were planted in soil in a growth chamber (16 hours light/8 hours dark, 25 ˚C, and 70% humidity). At the beginning of the jointing stage, part of DPW and HPW plants were grown under 8 hours light/16 hours dark, 25 ˚C, and 70% humidity (named as D-S and H-S, where S means a shorter photoperiod), other plants were grown under 16 hours light/8 hours dark, 25 ˚C, and 70% humidity (named as D-L and H-L, where L means a longer photoperiod). After 30 days of the photoperiod treatments, the stems from fifteen plants (two biological replicates) were collected and snap frozen in liquid nitrogen and stored at -80 ˚C until RNA and protein extraction. The total RNA of each sample (D-L, D-S, H-L and H-S) was isolated using the E.Z.N.A.® Total RNA Kit II (Cat. #: R6934-01, Omega) according to the user manual. The quality of Each RNA sample was checked 1) on 1% agarose gels; 2) and using the NanoPhotometer® spectrophotometer (Implen, CA, USA), and 3) with the RNA 6000 Nano Assay Kit of the Bioanalyzer 2100 system (Agilent Technologies, CA, USA). Samples with the RNA integrity number (RIN) above 8 were used for the next step. The Qubit® RNA Assay Kit in a Qubit® 2.0 Fluorometer (Life Technologies, CA, USA) was used to measure RNA concentration. mRNA was purified from total RNA using poly-T oligo-attached magnetic beads (Life Technologies, CA, USA) and transcribed to cDNA using random oligonucleotides with M-MuLV Rease Transcriptase (RNase H-) (TaKaRa) and DNA polymerase I and RNase H (TaKaRa). NEBNext adaptor oligonucleotides (Illumina) were ligated to the 3' ends of cDNA fragments adenylated with Klenow Exo- (Illumina). Approximate 200 bp cDNA fragments were purified using the AMPure XP bead system (Beckman Coulter, Beverly, USA). Ten cycles of PCR amplifications were conducted to enrich cDNA fragments ligated to the adaptors on both ends using the NEB Universal PCR primer and Index primer (Illumina). The PCR products were purified using the AMPure XP bead system and quantified using the Agilent high sensitivity DNA (Agilent Technologies, CA, USA) on the Agilent 2100 bioanalyzer system. Finally, the four-coded samples were clustered by the cBot cluster generation system using the TruSeq PE Cluster Kit v3-cBot-HS (Illumina) according to the user manual, and then sequenced using the 100 bp protocol on an Illumina Hiseq 2000 platform. Reads containing adapters, poly-N and low-quality reads were removed using Novogene-written Perl scripts to produce clean reads. The GC content and sequence duplication level of the clean data were calculated. The pair-end clear reads generated contigs using Trinity (V2012-10-15)  with a minimum K-mer coverage of 2 and other parameters with default values. Unigene definition and CDS prediction were conducted according to Zhang et al. and Krasileva et al. . Functions of unigenes were annotated using a series of databases, including BLASTx against the NCBI non-redundant protein (Nr), NCBI nucleotide collection (Nt) and Swiss-Prot databases with 10-6 as an E-value cutoff, and hmmscan against the protein family (Pfam) database. Functional categories of putative unigenes were grouped using the Kyoto Encyclopedia of Genes and Genomes (KEGG, http://www.genome.jp/kegg/), Clusters of Orthologous Groups of proteins (KOG/COG, http://www.ncbi.nlm.nih gov/COG/) database, and Blast2GO against Gene Ontology (GO, http://www.geneontology.org) . Clean reads were aligned against assembled transcript to generate read counts using the RSEM package . The read count of each unigene was converted into RPKM values to normalize the gene expression using the RPKM method . Differential gene expressions were calculated using the DEseq method . Stems were ground in liquid nitrogen with 0.1 mg polyvinylpyrrolidone (PVPP) and homogenized with Tris-phenol (pH 8.0) and protein extraction buffer (0.7 M sucrose, 0.1 M KCl, 50 mM EDTA, 0.5 M Tris, 2% β-mercaptoethanol and 1 mM PMSF) with a pH of 7.5. After 20 minutes centrifuge at 6,000 rpm, the supernatant was purified again using protein extraction buffer. The protein was precipitated by ammonium acetate methanol and then washed with methanol (twice) and acetone (twice). Finally, the protein was diluted with RIPA reagent. The protein concentration was measured using the BCA Assay Kit (Biotech) according to the user manual. iTRAQ labeling was performed according to Wu et al. and Tse et al. with minor modification. Briefly, 200 μg proteins of each sample were reduced, alkylated and then subjected to tryptic hydrolysis. The iTRAQ labeling was performed using iTRAQ® reagents - 8plex Kit (Applied Biosystems, Sciex) according to the user manual. Peptides from stem samples of H-L, H-S, D-L and D-S were labeled individually with the iTRAQ reporters 113, 114, 115, and 116, respectively. LC-MS (TripleTOF5600, Applied Biosystems, Sciex) analysis was performed according to Wu et al. . Protein identification and relative quantification were performed according to Ruppen et al. with minor modifications. Briefly, Protein Pilot software v4.0 (Applied Biosystems, Sciex) was used to convert the raw data (.wiff) into peak lists (.mgf). Each MS/MS spectrum was searched against a deduced protein database from RNA-Seq. The search parameters were as follows: Paragon method - iTRAQ-8plex, Cys alkylation - MMTS, Digestion - Trypsin, Instrument - TripleTOF 5600, ID focus - Biological Modifications and Amino Acids Substitutions, Detected Protein Threshold [Unused ProtScore (Confidence)] - ≥ 1.3, Competitor Error Margin (ProtScore) - 2.0, and No. Distinct Peptides (Confidence) - ≥ 95%. The averagely relative expression (fold-change ratios of differential expression between labeled protein samples), P value, error factor, lower confidence interval and upper confidence interval were calculated by Protein Pilot and then exported into Excel. Proteins with fold change ratios ≥ 2 or ≤ 0.5 and P values ≤ 0.05 were considered to be differentially expressed proteins (DEPs) [52, 61, 63]. Total RNA was isolated from the stems of DPW and HPW under photoperiod treatments, and genomic DNA was removed using an RNase-free DNase set (Omega) according to the user manual. The qPCR and data analysis were performed as described by Wang et al. . Ten differentially expressed genes from RNA-Seq were validated, and their primers are listed in Additional file 4: Supplementary Table 1. Actin, as described by Wang et al. , was used as a reference gene to normalize gene expression. At the jointing-booting stage, the second internode stems of DPW and HPW treated with different photoperiods, under growing seasons and sprayed with phytohormones were fixed in Carnoy's fixative I (3 parts of 95% ethanol to 1 part of glacial acetic acid). Sections (cross and longitudinal) with 10-μm-thick were cut on a cryostat microtome (Leica, CM1850, UV) with 1% agarose gel. After removing agarose gel using QIAquick Gel Extraction Kit (Qiagen, Cat. #: 28706, USA), the sections were stained with 1% safranin O (Solarbio) in water for 3 hours, rinsed three times in 85% ethanol for 10 minutes, and then counterstained with an alcoholic solution of fast green FCF (Solarbio, Cat. #: 907A035) (1 mg fast green FCF in 200 ml 50% ethanol) for 20 seconds. Images were captured using a Photometrics SenSys CCD camera on an Olympus BX-51 microscope (Olympus, Tokyo, Japan). In maturation stage, DPW with a plant height of 78.35 ± 4.42 cm was significantly shorter than HPW with a plant height of 157.08 ± 9.76 cm (P < 0.05, Fig. 2A). DPW and HPW had five and six internodes, respectively (Fig. 2B), and each internode of DPW was significantly shorter than the corresponding internode of HPW (P < 0.05, Fig. 2B). The spike lengths (Fig. 2C) and tiller numbers (Fig. 2A) between DPW and HPW were similar, but the glume of HPW was larger than that in DPW (Fig. 2C). DPW had dark green and erect leaves, while HPW had yellow-green and curled leaves (Fig. 2D). The seed length of DPW was similar to that of HPW, but the seed width of DPW was narrower than that in HPW (Fig. 2E), which resulted in a significantly lower 1000-seed weight for DPW compared to HPW (P < 0.05, Fig. 2F). However, the dark green and erect leaves and the narrower seeds were not associated with the dwarfism of the F2 population (Fig. 2D and E). Li et al. reported a photoperiod-sensitive dwarfing gene Psd1 whose plant height was restored by short-day growth. Whether Rht-dp was also a photoperiod-sensitive dwarfing gene? The stem lengths of H-S (47.41 ± 4.32 cm) and H-L (50.83 ± 4.30 cm) were significantly longer than that of D-S (28.52 ± 4.01 cm) and D-L (31.76 ± 3.64 cm) (P < 0.05) (Fig. 2G), the photoperiod treatments therefore did not affect the stem elongations in both DPW and HPW. The plant heights of DPW were not rescued by short or long photoperiods (Fig. 2G). These results indicated that Rht-dp was a photoperiod-insensitive dwarfing gene, and the stems were suitable for RNA-Seq and iTRAQ analysis to reveal the molecular mechanism of dwarfism. Morphological traits. A: Plant heights of HPW and DPW at the maturate stage. B: Each internode length of HPW and DPW at the maturate stage; the first internode was below the spike; all data were collected from 10 plants with three replicates. C: Spikes and glumes of HPW and DPW. D: Leaves of HPW, DPW and 7 F2 plants. E: Seeds of HPW, DPW and 4 F2 plants; D and H represented DPW and HPW type, respectively. F: 1000-seed weights of HPW and DPW. G: Stems of HPW and DPW under photoperiod treatments; total of 4 internodes; H-S and D-S were HPW and DPW plants, respectively, grown under 8 hours light/16 hours dark, 25 ˚C, and 70% humidity; H-L and D-L were HPW and DPW plants, respectively, grown under 16 hours light/8 hours dark, 25 ˚C, and 70% humidity. H: Plant heights of DPW sprayed with different phytohormones, respectively. The bars in B and F represented standard deviation from three replicates; the data and figures were analyzed and drawn using SigmaPlot 12.0. Previous studies indicated that some dwarfisms were restored by spraying with phytohormones [6-7, 13]. We also examined this possibility in DPW. Compared with the control (78.35 ±4.42 cm), the application of exogenous ABA, auxin, CK and BL did not restore the plant heights of DPW, which were 78.22 ± 4.40 cm, 81.13 ± 6.01 cm, 79.22 ± 4.68 cm, and 82.22 ± 5.14 cm, respectively (Fig. 2H). These results indicated that Rht-dp was an ABA-, CK-, BR- and auxin-insensitive dwarfing gene. To understand the dwarfing mechanism of Rht-dp, the transcription levels of stems from DPW and HPW were analyzed using RNA-Seq. All raw reads were deposited into the NCBI Sequence Read Archive (SRA) database with accession number SRX1452957. After cleaning and quality checks, a total of 108,106,616 100 bp pair-end reads consisted of 57,404,542 from D-S and 50,702,074 from D-L, were obtained. Reads from D-S and D-L were assembled and produced 212,645 transcripts with an average length of 1064 bp. After gap filling, the transcript including 102,876 DPW unigenes with an average length of 680 bp was further assembled. A total of 94,223,698 100 bp pair-end reads including 45,565,570 from H-S and 48,658,128 from H-L were also obtained. A total of 189,216 transcripts with an average length of 1,000 bp were assembled. Further assembly generated 98,455 HPW unigenes with an average length of 673 bp. To normalize the expression of unigenes and identify differentially expressed genes (DEGs) involved in DPW dwarfism, a chimera including 268,932 transcripts with an average length of 1,070 bp was assembled from all the reads of DPW and HPW. Further assembly produced 124,395 chimeric unigenes with an average length of 671 bp. The sequences of these unigenes were deposited into the NCBI Transcriptome Shotgun Assembly (TSA) database with accession number GEDQ00000000. The open reading frames and CDS of 38,347 (32.27%) DPW unigenes, 37,934 (38.53%) HPW unigenes and 42,397 (34.08%) chimeric unigenes were successfully predicted using BLASTx against the NCBI Nr and Swiss-Prot databases with a cut-off E-value of 1e-6. The open reading frames and CDS of another 55,963 (54.40%) DPW unigenes, 52,767 (53.60%) HPW unigenes, and 70,903 (57.00%) chimeric genes that were not predicted by NCBI Nr and Swiss-Prot were predicted using ESTScan. A total of 56,394 DPW unigenes (54.82%), 55,079 HPW unigenes (55.94%) and 64,700 chimeric genes (52.01%) were successfully functionally annotated in at least one of the databases. The annotated information of these unigenes was deposited into the NCBI TSA database with accession number GEDQ00000000. Because the photoperiod treatments on DPW and HPW did not significantly change the stem lengths (Fig. 2G), dwarfism-related genes should exhibit significantly differential expression (P < 0.05) between D-L and H-L, D-S and H-S, D-S and H-L, and D-L and H-S, but not between H-L and H-S or D-L and D-S. Based on these conditions, 108 DEGs including 35 that were down-regulated and 73 that were up-regulated (DPW/HPW) were considered dwarfism-related genes (Additional file 1). Among of these DEGs, 6 DEGs (Table 1; Fig. 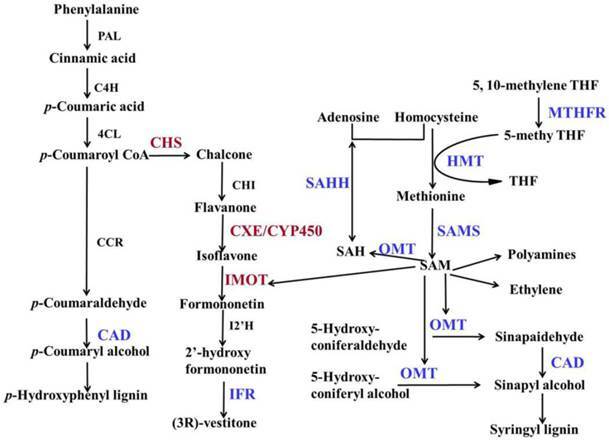 3), carboxylesterase 6 (CXE), 2 chalcone synthases (CHS), cytochrome P450 (CYP450), isoflavone reductase (IFR), and O-methyltransferase (OMT), were involved in flavonoid metabolism. 5 DEGs (Table 1), beta-galactosidase 2 (β-GAL), expansin-B10 (EXPB10), expansin-B7 (EXPB7), xyloglucan endotransglucosylase/hydrolase protein 19 (XTH19) and glucan endo-1,3-beta-glucosidase (β-GLU), were involved in cellulose metabolism, mainly in cell wall plasticity and cell expansion. 2 DEGs (Table 1), ABC transporter B family member 2 (ABCB2) and pleiotropic drug resistance protein 2 (PDR2/ABCG2) involved in auxin transport, were down-regulated in DPW. The differential expressions of genes between DPW and HPW were also validated by qRT-PCR, namely the expressions of 10 DEGs in D-L, D-S, H-L and H-S. As shown in Fig. 4, the expression levels of CXE, CHS, CYP450 and β-GLU in D-S and D-L were significantly higher than that in H-L and H-S; in contrast, the expression levels of IFR, OMT, β-GAL, EXPB10, ABCB2 and PDR in D-S and D-L were significantly lower than that in H-S and H-L (Fig. 4). Proteins were identified based on having at least one peptide with Unused ProtScore ≥ 1.3 (with a confidence of ≥ 95%). A total of 2,028 (Additional file 2) unique proteins were identified from the deduced protein database (DPD) of the chimera using BLASTx. Meanwhile, 1,592 proteins with two or more high-confidence peptides were used to further select dwarfism-related DEPs (the identified peptide information was listed in Additional file 3). DEGs and DEPs in the phenylpropanoid biosynthetic pathway. Modified biosynthesis pathways of lignin and flavonoid (Moffatt et al., 2002; Piślewska et al., 2002; Bonawitz and chapple, 2010; Dao et al., 2011; Vanholme et al., 2010; Rípodas et al., 2013; Tang et al., 2014). PAL: phenylalanine ammonia-lyase; C4H: cinnamate 4-hydroxylase; 4CL: 4-coumarate:CoA ligase; IFR: isoflavone reductase; CCR: cinnamoyl CoA reducatase; CAD: Cinnamyl alcohol dehydrogenase; SAHH: S-adenosyl- L -homocysteine hydrolase; MTHFR: methylenetetrahydrofolate reductase; HMT: homocysteine methyltransferase; SAMS: S-adenosyl-methionine synthase; OMT: O-methyltransferase; SAM: S-adenosyl-L-methionine; SAH: S-adenosyl-L-homocysteine; THF: tetrahydrofolate; CHI: chalcone flavanone isomerase; IOMT: isoflavone-7-O-methyltransferase; CXE: carboxylesterase; CYP450: cytochrome P450; I2'H: isoflavone 2'-hydroxylase. Red represented up-regulation, blue represented down-regulation in DPW. qRT-PCR validation of the expression levels of 10 DEGs from RNA-Seq. Bars represented standard errors from three biological replicates. Asterisks represented significant differences between DPW and HPW. The data analysis and figures were obtained using SigmaPlot 12.0. Note: a: UP, Unused ProtScore; b: No., Number of distinct peptides (confidence ≥ 95%). Likely as dwarfism-related DEGs, the values of dwarfism-related DEPs in H-L/D-L, H-L/D-S, H-S/D-S, H-S/D-L must be ≥ 2 or ≤ 0.5 with P ≤ 0.05; in H-L/H-S and D-L/D-S, they must be between 0.5 and 2. Based on these criteria, 12 proteins (6 down-regulated and 6 up-regulated in DPW) were identified as dwarfism-related DEPs (Table 2). 6 DEPs, cinnamyl alcohol dehydrogenase (CAD), O-methyltransferase (OMT), methylenetetrahydrofolate reductase (MTHFR), homocysteine methyltransferase (HMT), S-adenosyl-methionine synthase (SAMS), and S-adenosyl-L-homocysteine hydrolase (SAHH), were mainly functioned in S-adenosyl-methionine (SAM) metabolism (Table 2, Fig. 3). Three DEPs, pyruvate decarboxylase isozyme 1 (PDC), beta-glucosidase 34 (β-GLU34) and endoglucanase 18 (EGL), were involved in the cellulose metabolism. Three other DEPs, 2 histone H1 proteins and a peroxidase 40, were up-regulated in DPW. Since 6 DEGs involved in flavonoid metabolism, 6 DEPs involved in SAM/lignin metabolism, and 5 DEGs and 3 DEPs involved in cellulose metabolism, the contents of flavonoid, cellulose and lignin should be differences between DPW and HPW. Under photoperiod treatments, the epidermis (Fig. 5A and C) and xylem (Fig. 5B and D) were stained red with safranin O in both H-L (Fig. 5A-B) and H-S (Fig. 5C-D). These results indicated that the lignification of these tissues and the lignin contents of H-L and H-S were similar. However, in both D-L (Fig. 5E-F) and D-S (Fig. 5G-H), only protoxylem vessels were stained red with safranin O, while other tissues were stained green with fast green FCF. These results indicated that the lignin contents of H-L and H-S were higher than that in D-L or D-S.
To validate that the different lignin contents between DPW and HPW were not caused by photoperiod treatments, we also analyzed the lignin contents in both DPW and HPW during stem elongation under a normal growth season. The epidermis, xylem vessels and tissues around vascular bundles in HPW were stained red with safranin O (Fig. 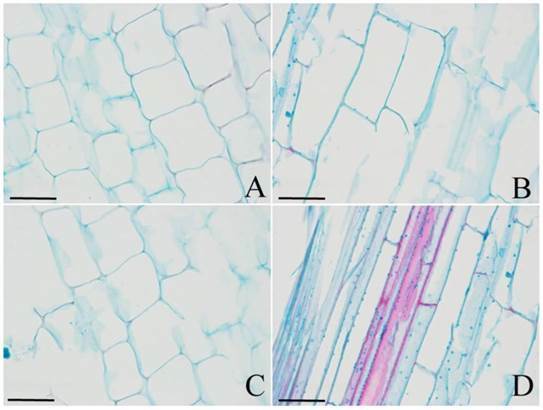 6A-B); the xylem vessels were stained red, while the epidermis and tissues around vascular bundles in DPW were weakly stained (Fig. 6C-D). 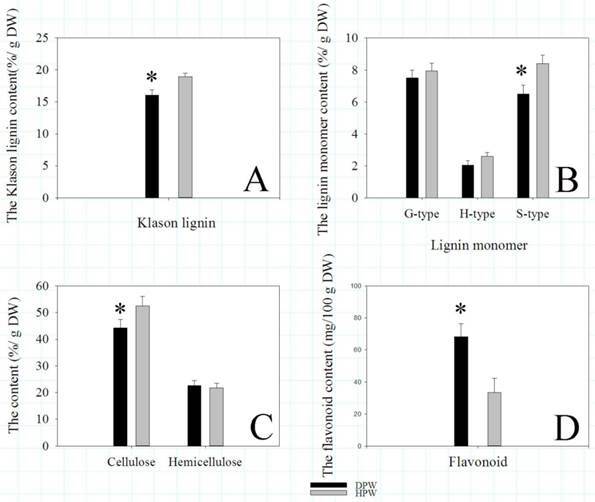 Furthermore, the difference in lignin content between DPW and HPW was confirmed by the content of Klason lignin, which was significantly lower in DPW than that in HPW (Fig. 7A). Further analysis indicated that the significantly lower syringyl lignin (S type) content in DPW than that in HPW caused the different lignin content between DPW and HPW (Fig. 7B), as the contents of guaiacyl (G type) and p-hydroxyphenyl (H type) were similar between DPW and HPW (Fig. 7B). Histochemical staining of lignin in DPW and HPW stems under photoperiod treatments. Cross sections of stems were collected from the second internode. A-B: H-L; C-D: H-S; E-F: D-L; G-H: D-S. Cross-sectional images of A, C, E and G were captured at 10 µm; B, D, F and H were captured at 40 µm. Lignin was stained red by afranin O.
Histochemical staining of lignin in DPW and HPW stems under normal growth season. Cross sections of stems were collected from the second internode. A-B: HPW; C-D: DPW. Lignin was stained red by afranin O. Images of A and C were captured at 10 µm; images of A and C were captured at 40 µm. Klason lignin, lignin monomer, cellulose, hemicellulose, and flavonoid contents. Asterisks represented significant differences between DPW and HPW. The data analysis and figures were obtained using SigmaPlot 12.0. Likely as several DEGs and DEPs involved in cellulose metabolism, the content of cellulose in DPW was significantly lower than that in HPW (Fig. 7C). However, the contents of hemicellulose were similar (Fig. 7C). Meanwhile, as some DEGs and a DEP involved in flavonoid metabolism, the content of flavonoid in DPW was significantly higher than that in HPW (Fig. 7D). The regulation of cell division and/or cell expansion determines the final morphology of plant organs. To understand which mechanism causes the dwarfism in DPW, or if both do, the cell number and size were observed. As shown in Fig. 8, the size of longitudinal cells in DPW (Fig. 8A) was significantly smaller than that in HPW (Fig. 8B) during stem elongation; meanwhile, photoperiod treatments also did not affect cell size in HPW (Fig. 8C) and DPW (Fig. 8D). These results indicated that Rht-dp caused dwarfism in DPW by limiting cell expansion. The cell size of DPW and HPW stems. Longitudinal sections of stems were collected from the second internode. A and C: DPW; B and D: HPW. 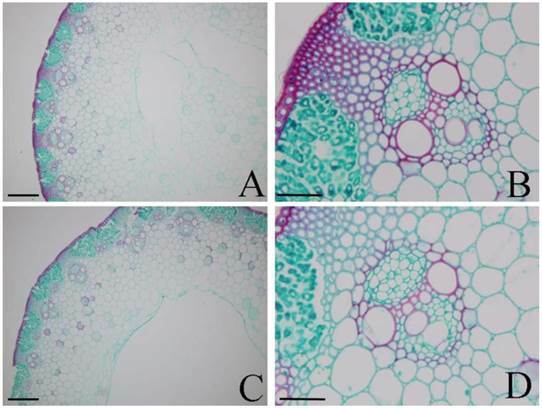 A and B: at the stage of stem elongation under normal growth season; C and D: at stem elongation under photoperiod treatments. The image scales were 40 µm. Because wheat has a larger genome and lacks complete genomic sequencing information, RNA-Seq has been widely used in wheat and its relative species [70-72, 46-47]. In this study, 102,876 DPW (Additional file 1), 98,455 HPW (Additional file 2) and 124,395 chimeric (Additional file 3) unigenes were assembled, which was less than the 140,118 unigenes of T. turgidum . To yield high-quality annotated unigenes, approximately 50% of unigenes with E-values ≤ 1e-6 were not functionally annotated using BLASTX. As proposed by Krasileva et al. , these unigenes should be (1) wheat-specific genes and rapidly evolving gene families, (2) expressed pseudogenes that have accumulated too many mutations, (3) non-coding transcribed sequences, (4) pieces of 5' and 3' UTRs, and (5) general assembly artifacts. Different dwarfing genes have different phenotypic effects. 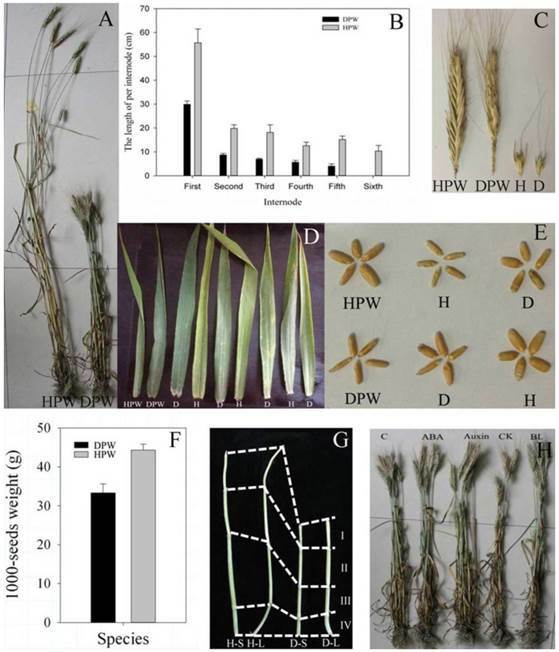 The semi-dwarfing gene sd37 generates shorter internodes in mutant rice than that in wild type . Compared with HPW, Rht-dp caused dwarfism in DPW by reducing internode number (Fig. 2A and B) and limiting cell expansion (Fig. 8), which was unexpected as sd37 in rice  and Rht22 in T. turgidum  cause shorter internodes by reducing cell number. However, some dwarfing genes in rice or Arabidopsis cause dark green and erect leaves, short seeds and small panicles [6-10]. Compared with HPW, although DPW had dark green and erect leaves (Fig. 2D), shorter glume (Fig. 2C), narrower seeds (Fig. 2E), lighter seed weight (Fig. 2F), and shorter coleoptile and smaller seedling leaf area , the dark green and erect leaves and the narrower seeds were not associated with the dwarfism in the F2 population (Fig. 2D and E). These results indicate that Rht-dp has no effect on leaves and seeds and also has a different dwarfing mechanism. Some GA-sensitive dwarfing plants such as rsg dwarfing tobacco  and Rht12 dwarfing wheat  can be restored by the application of exogenous GA. BR-sensitive dwarfing plants such as d2  and d11  dwarfing rice also can be restored by exogenous BL. However, likely as other phytohormones-insensitive dwarfing genes, Rht-dp was GA- , BL-, ABA-, CK- and auxin-insensitive (Fig. 2H), suggesting that Rht-dp might disturb the biosynthesis, signaling or transport of one or more of these or other phytohormones (e.g., strigolactones and SA) [28-30] as well as other non-phytohormones such as phenylpropanoid metabolism [32-33, 36, 74]. However, photoperiods can regulate the signaling and transport of several phytohormones (GA, CK, BR, ABA and auxin) to mediate plant growth and development [75-76]. Meanwhile, a photoperiod-sensitive dwarf (Psd1) causes dwarfism in rice by disturbing cell division and elongation . In contrast, Rht-dp was a photoperiod-insensitive gene (Fig. 2G), but the possibility of involvement in the signaling or transport of GA, CK, BR, ABA or auxin cannot be excluded. Therefore, stems collected from photoperiod treatments were used for transcriptomic and proteomic analysis to reveal the dwarfing mechanism. In vascular plants, the phenylpropanoid pathway including lignin, flavonoid and ethylene biosynthesis is involved in many physiological processes [31-32]. Previous studies indicated that the knockout or knockdown of one or more genes of the phenylpropanoid pathway, such as CAD and COMT , cause dwarfism through the reduction of lignin content. Lignin, as a complex aromatic polymer, is mainly present in secondarily thickened cell walls to provide strength, rigidity and hydrophobicity [77-78]. Compared with HPW, the expression levels of CAD (DEP) and OMT (DEG) were down-regulated in DPW, which was consistent with the lower lignin content in stems based on histochemical staining (Fig. 5 and 6) and Klason lignin and monomer analysis (Fig. 7A-B). Therefore, we proposed that the mechanism of dwarfism of DPW was related to lignin biosynthesis during stem elongation. S-adenosyl-L-methionine (SAM), a precursor of ethylene and polyamines and a methyl group donor for protein and DNA methylation reactions , regulates numerous cellular functions. As key biosynthesis enzymes, the knockdown of MTHFR, HMT or SAMS decrease SAM content [80-82] which provide the methyl donor to OMT in lignin biosynthesis, finally significantly decrease lignin content [80, 82]. Importantly, in addition to SAM decrease, the knockdown of SAMS also causes dwarfism in rice . Meanwhile, the knockdown of SAHH in tobacco causes dwarfism with increasing CK and S-adenosyl-L-homocysteine (SAH) content [33, 84] which is a by-product from SAM-dependent methylation reactions that competitively inhibit SAM-dependent transmethylation . Compared with HPW, the proteins of MTHFR, HMT, SAMS and SAHH were down-regulated in DPW. These results suggested an increase in SAH and decrease in SAM content, which would cause a decrease in OMT methylation reactions (Table 1) in lignin biosynthesis or a decrease of ethylene and polyamines. Plant polyamines play important roles in a wide range of developmental processes, such as stem elongation. Increasing reports have indicated that the disrupted polyamine biosynthesis limits stem elongation and thus causes dwarfism [85-88]. Meanwhile, up-regulated arginine decarboxylase (ADC) was observed in DPW (Additional file 1). Interestingly, overexpression of ADC changes polyamine content and causes dwarfism in tobacco . Therefore, we did not exclude disrupted polyamine biosynthesis as a possible dwarfing mechanism. Previous studies have indicated that CHS induction or IOMT overexpression increases flavonoid content [37, 89-91]. IOMT consumes SAM and produces SAH . Meanwhile, CEX (2-hydroxyisoflavanone dehydratase, HID), IFR and CYP450 (2-hydroxyisoflavanone synthase, IFS) are also key enzymes in flavonoid biosynthesis [92-94]. Compared with HPW, the expression levels of 2 CHS, CEX, CYP450 and IOMT were up-regulated in DPW, which caused the flavonoid content to be higher in DPW than that in HPW (Fig. 7D), and might result in low SAM and more SAH in DPW. Plant flavonoids, inhibited the activity of some ABC transporters (ABCB family and PDR) that act as auxin transporters [95-98], can regulate cellular auxin efflux and, consequently, auxin polar transport [37, 96, 99-100]. Auxin polar transport is crucial in the regulation of growth processes such as cell division and cell expansion [98, 101-102], which are important in dwarfism [25-27]. As flavonoid content increased (Fig. 7D), ABCB2 and PDR transcripts were down-regulated in DPW (Table 1), thus inhibiting auxin transport and causing dwarfism . However, IFR, also involved in isoflavonoid biosynthesis, was down-regulated in DPW; this was similar to the mechanism by which knockdown of IFR caused dwarfing Phaseolus vulgaris . To grow, plants need to loosen their primary cell walls to achieve cell expansion [103-104]. Several studies have indicated that directed cell expansion is dependent on the synthesis and deposition of cellulose [104-107] which is a major component of the cell wall . Cellulose is completely hydrolyzed by exoglucanase, EGL and β-GLU . Meanwhile, several proteins located in the cell wall, such as EXPA and XTH, remodel and disassemble the cellulose and xylogucan framework, thereby increasing cell wall extensibility and regulating growth and development [103-104, 110-113]. EXPA loosens cell walls, and cell extension is activated by auxin [114-115]. EGL, EXPA10, EXPA7 and XTH were down-regulated in DPW (Table 1 and 2), which reduced cellulose content (Fig. 7C, 104, 116). Additionally, auxin transport was inhibited by the increase of flavonoids (Fig. 7D) and the down-regulation of ABC transporters (Table 1). As such, the cell wall extensibility was reduced, limiting cell expansion (Fig. 8), consequently shortening stems and causing dwarfism (Fig. 2A, 2B and 2G). In summary, our findings suggest that Rht-dp, involved in the phenylpropanoid pathway, reduces the contents of lignin, cellulose and SAM, and increases the contents of flavonoid and SAHH, then may limit auxin transport and reduce extensibility of the cell wall, finally limits cell expansion and causes dwarfism in DPW. It will provide a great help to understand the new dwarf mechanism in DWP and perform further researches that fine mapping, clone and functioned analysis of Rht-dp. The detail information of dwarfism-related DEGs. The detail information of believed proteins identified from iTARQ. The detail peptide information of dwarfism-related DEPs. Supplementary Table 1 - qRT-PCR primers for the normalization of DEGs. The authors thank the National Natural Science Foundation of China (grant no. 31301349, 31270243 and 31470305), the Bureau of Science and Technology and the Bureau of Education of Sichuan Province, China. Corresponding author: Yonghong Zhou, Fax: +86 028 826 503 50, E-mail address: Zhouyhedu.cn.